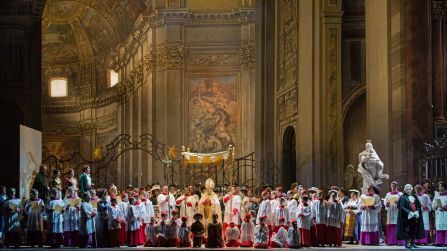 A spectacular reconstruction of the original 1900 production of Tosca in Rome. Daniel Oren conducts an operatic thriller replete with murder, execution and suicide. Angelotti escaped from the Castel Sant’Angelo where he was imprisoned for treason, and has fled to the empty church, Sant'Andrea della Valle. Using a key his sister had hid¬den for him, he lets him¬self into the family chapel where a disguise of women's clothing has been left. Cavaradossi, a painter, returns to continue work on his painting of Mary Magdalene. The Sacristan, already disapproving of the painter, is further shocked by the fact that a woman who has recently been coming to the church alone to pray (in fact, Angelotti’s sister) has been the unwitting model for the painting. When the Sacristan leaves, Angelotti comes out of the chapel. 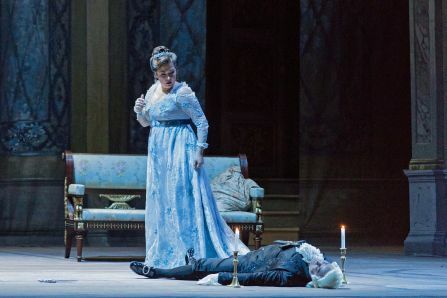 He and Cavaradossi recog¬nize each other, but they are inter¬rupted by the arrival of the renowned singer Tosca, who is Cavaradossi’s lover, and Angelotti hides again. 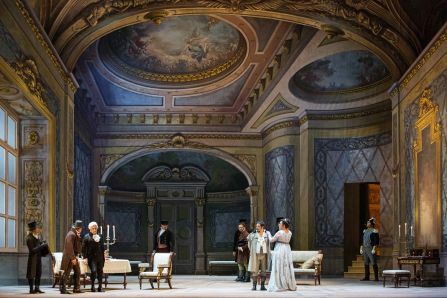 Tosca, unreasonably jealous, accuses her lover of seeing another woman, but Cavaradossi calms her and they arrange to meet at his villa later that evening. The painting of Mary Magdalene also arouses Tosca’s jealousy but Cavaradossi hurries her out. Returning to Angelotti he offers him use of his villa and describes a hiding-place, half-way down a well in the garden. A can¬non shot announces that the escape has been discovered and Cavaradossi decides to lead Angelotti to the villa himself. 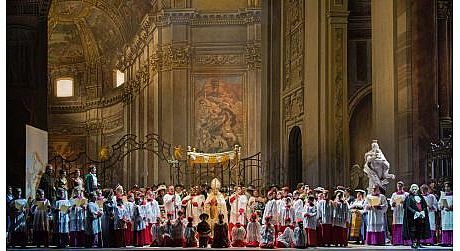 The Sacristan returns with news of victory in the Franco-Italian war, and as the choristers rush in he explains that the celebrations will include a cantata to be sung by Floria Tosca at the Palazzo Farnese and a Te Deum at the church. Scarpia, the chief of police, having been informed of Angelotti’s escape, enters the church. On interrogating the Sacristan he connects Angelotti with the painter and the portrait of Angelotti’s sister. In the open chapel he finds a fan dropped from the bundle of women’s clothing. 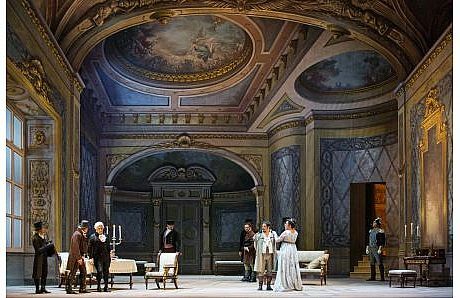 Tosca returns to explain to Cavaradossi that as she is to perform in the celebratory cantata she will be unable to meet him that evening. Finding him gone she is again suspicious, and Scarpia uses the fan to further provoke her jealousy. When she goes off to confront Cavaradossi and his sup¬posed lover at the villa, Scarpia sends his agents to follow her. 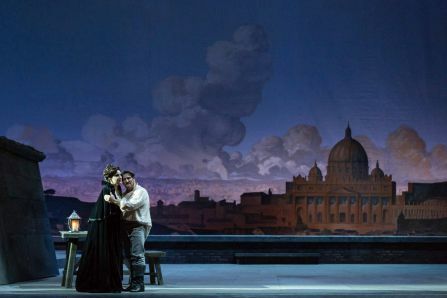 As the Te Deum begins Scarpia lays his plans to captivate Tosca and execute her lover. Scarpia is still obsessed with his plans for Tosca and Cavaradossi. He gives one of his agents, Sciarrone, a note to pass to Tosca when she arrives for the cantata. 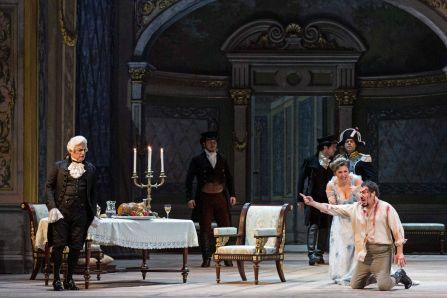 Another agent, Spoletta, comes back from Cavaradossi's villa having found no trace of Angelotti, but appeases Scarpia with the news that he has arrested Cavaradossi. 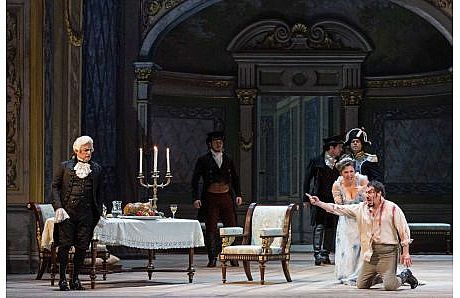 Scarpia calls Cavaradossi in to question him, but the painter denies all knowledge of Angelotti’s escape or whereabouts. The cantata has ended and Tosca enters; Scarpia sends Cavaradossi off to another room for further interrogation, and then turns his attention to Tosca. She too will give no information but as she hears Cavardossi’s cries of pain as he is being tortured, she reveals Angelotti’s hiding-place. Cavaradossi is brought back from the torture chamber. Sciarrone arrives with the news that the earlier report from Marengo was premature and that the French had gained a victory. Cavaradossi’s enthusiastic response to this provokes Scarpia to sentence him to death and he is led off. 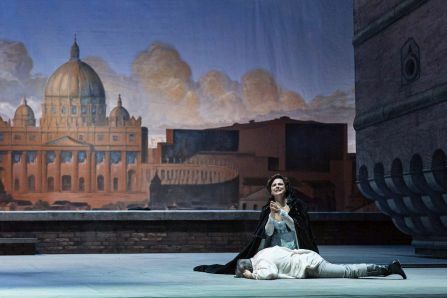 Scarpia offers Tosca the one way of ensur-ing Cavaradossi's release - she must give herself to him. Spoletta returns to report that Angelotti had killed him¬self on being discovered. He waits for instructions on what to do with Cavaradossi. Tosca nods her agreement to Scarpia’s proposal, but wants her lover to be released immediately. In order that the painter will be thought dead, Scarpia decides on a mock execution and instructs Spoletta to carry this out, stressing that it should be done as on a previous occasion. 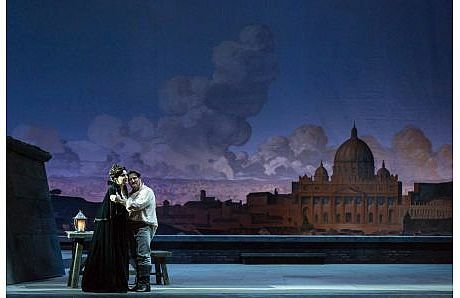 Tosca asks for a safe-conduct permit for herself and Cavaradossi to be able to leave Rome. As Scarpia is writing it she catches sight of a knife on the sup¬per table and as he is about to embrace her, she plunges it into his heart. A shepherd boy is heard singing in the distance. Nearby church bells ring for the mass as Cavaradossi is led on and consigned to a jailer whom he bribes to take a letter to Tosca. Suddenly she arrives with the safe-conduct permit which she and Cavaradossi read ecstatically together. She tells him how she murdered Scarpia and explains the mock execution. Soldiers arrive and carry out the execution of Cavaradossi. 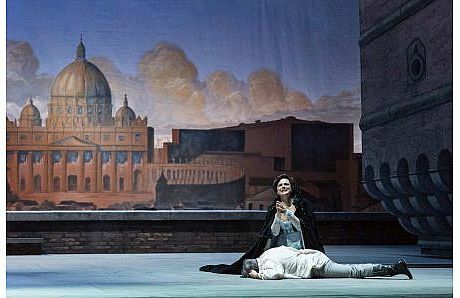 When they have left, Tosca discovers that Scarpia has tricked her and that Cavaradossi is dead. Scarpia’s body has been found; his agents and the soldiers rush in to catch Tosca, but she evades them by throwing herself to her death. The curtain has just descended on the final scene of the opera. The hour is late. Nut the experience was riveting. This is the time to meet several of the performers. Come to listen and to speak . Ask questions. Meet the artists. A once in a lifetime opportunity to meet the artists who have just excited you on the stage. Opera Talkbacks takes place on the second level of the Opera House foyer and last around 30 minutes. Admission free. Opera Talkback takes place on several evenings in each production . Details can be found on the Israeli Opera’s website.